cambodia — ...and we're off! 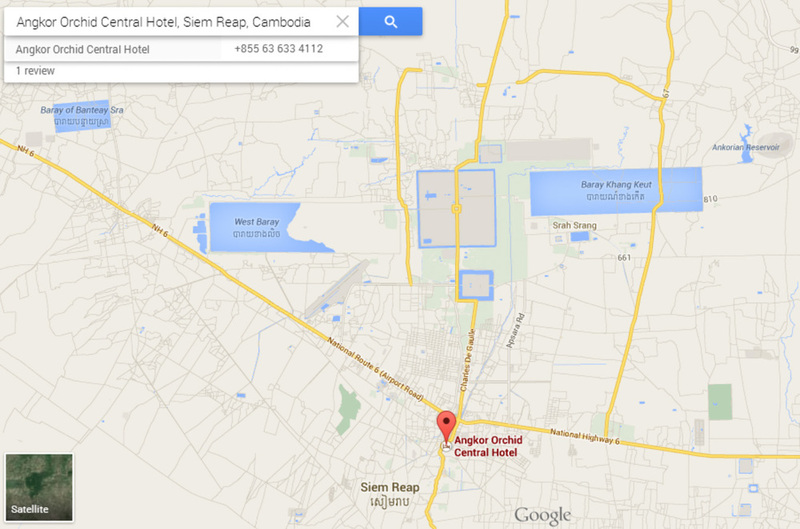 on a warm tuesday evening we arrived in siem reap and took a cab to our hotel. our options for reasonably priced accommodations were plentiful, and we debated between a luxurious resort farther away for $58 per night, or a simple hotel in the main part of town for $14. we went with the latter, and it turned out to be a good idea. it was nice being walking distance from the action. after settling in, we walked through the night market to pub street, where we enjoyed 50 cent beers and $3 amok (a type of khmer curry). 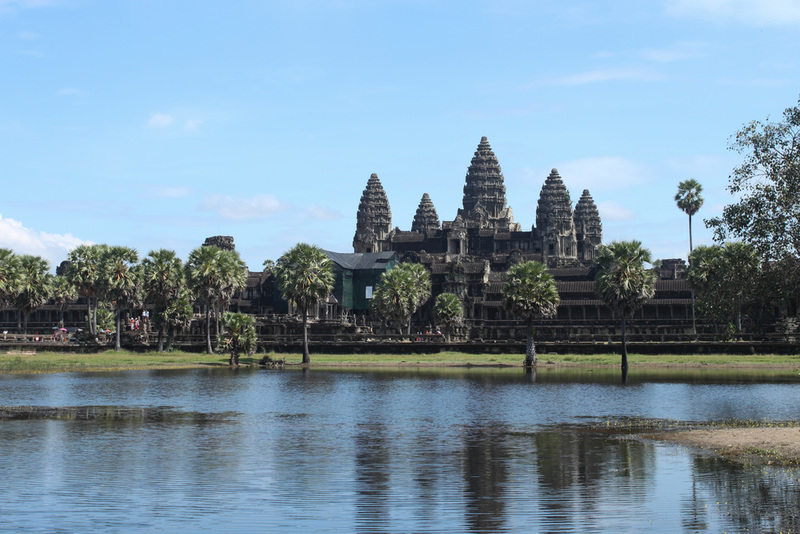 in the last decade, the area has changed dramatically to accommodate the throngs of tourists who flock here to see angkor wat. everything was also listed in US dollars, which was both convenient and a little awkward. it felt strange paying people practically nothing using our own currency, especially knowing that they knew just how dirt cheap it was for us. pretty view of the temple from the western side of the complex. we gave ourselves only one full day to check out the temples - albeit a bit reluctantly - but amazingly enough, it turned out to be the best cultural experience we could've asked for. we decided to call up sinn, our cabbie from the night before, and take him up on his offer to be our driver. he was surprised and elated, since most people prefer to book through their hotels. it was a very hot, sunny morning, and we were glad we chose an air-conditioned car over a tuk-tuk! our first stop was angkor wat. built in the twelfth century, it was well-preserved and quite impressive. with the sun shining, we crossed the bridge over the glistening moat and into the enormous complex, admiring the carefully planned grounds and symbolic layout. although it later became a buddhist place of worship, the temple was originally designed to be a microcosm of the hindu universe, with the moat representing the oceans and the five towers symbolizing the peaks of mount meru, home of the gods. the stairs were so steep, it really did feel like we were climbing a mountain! even with all the people around, it was quite a spiritual experience. as a fun surprise, several monkeys came up to say hello when we walked out the back and along the forested trail. cuteness passport for the win! the bride came by for a quick photo with the randoms! when we met up with sinn afterwards, he asked us if we could make a quick detour to the countryside before we visited the other temples. his friend was getting married, and he was wondering if we would mind making an appearance? we immediately said yes. we took a long, very bumpy dirt road, and along the way we got to see a bit of what life was like away from the touristy area. unfortunately the ruthless khmer rouge regime left the country in shambles and most people impoverished, and though it's been over thirty years since they were overthrown it still appeared to be that way. a few children happily playing in the muddy water offset the sad-looking, half-built huts nearby. there were also some nicer, more established homes that dotted the area, and sinn explained that here, the "rich" and the poor tend to live on plots side by side. eventually we arrived at our destination. never in a million years did we think we'd crash a wedding in asia, much less cambodia! the celebration took place outside the bride's parents' home, where they'd set up a colorful tent complete with decorated tables and space to dance. for two hours we timidly nibbled on local fare (but avoided the fish paste mixed with dried ants - yikes), drank beer out of straws, and danced around to traditional music. the weather also went from sunny to very rainy, which didn't seem to upset the party. in cambodia it's considered a good omen if it rains at your wedding, which meant everyone was all the more cheerful and ready to dance in the mud. we spent the rest of the afternoon at two other temples, and the first was angkor thom. 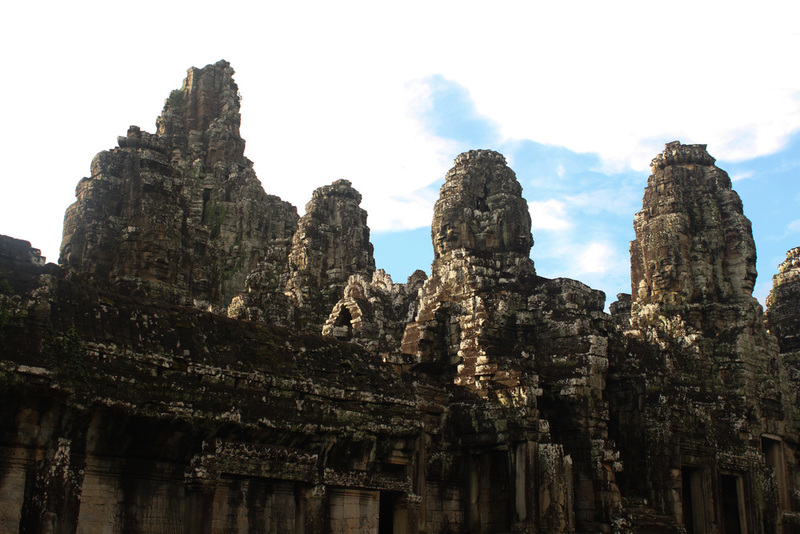 set in a tall green forest with the afternoon sun peeking through, angkor thom was like stepping into another world. built in the twelfth century, the temple had taken on a greenish hue over time, and everywhere you turned a buddha face smiled at you. the effect was very serene, and unlike any place of worship we've visited. i felt very at peace here. ta phrom, another temple built in the twelfth century, happened to be where the movie tomb raider was filmed. this was obvious as soon as we entered. at this one more than any other, the jungle had reclaimed much of what it had once lost. tall trees with impressive roots snaked their way over and around temple walls and hugged lonely crevices, lending an eerily beautiful quality to the complex. here was dramatic evidence of mother nature's relationship with one of mankind's incredible architectural marvels. when we finally returned to our hotel, we couldn't believe all that we'd been lucky enough to see and experience that day. we decided to close out our short but memorable tour of siem reap with a few more cheap beers and a $1 fish foot massage for me. as soon as my toes approached the water, dozens of tiny fish appeared, their mouths open and waiting. it took me five minutes before i could force my toes into the water and let the feeding frenzy begin! it was a weird sensation, and it tickled like crazy. the next day was thanksgiving, and we had much to be thankful for as we packed our bags and headed to the airport with sinn back in the driver's seat. we recommended him to our friend deepa, and he ended up being her driver when she visited a month later! we left cambodia with some great memories as we took off for singapore. monkeying around in the forest behind the temple.